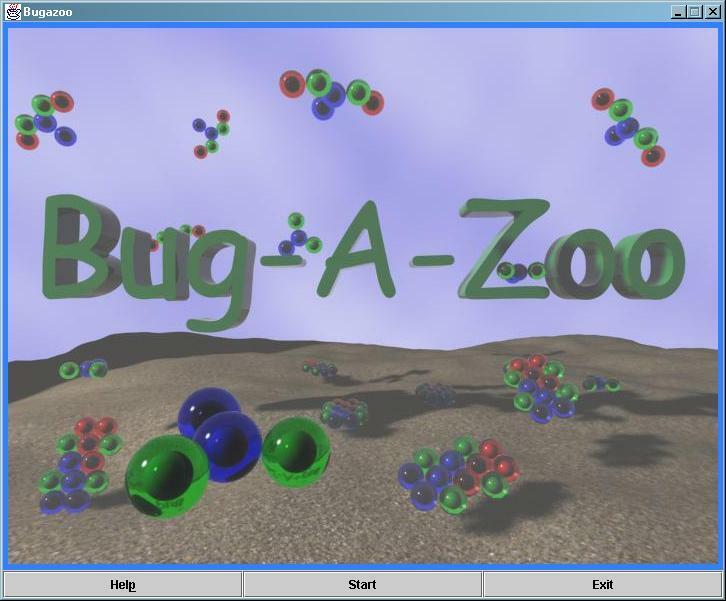 Bug-a-Zoo is a simulation of life. On a playground creatures move around and feed. Creatures reproduce if they are well fed and die if they are not. Creatures see their environment and take actions like move towards food or run away from predators. During reproduction creatures may mutate. Mutants may be more or less successful in life than their parents. In this way better adapted species may turn up. The simulation may run for hours. Refer to the help page for a more extensive description or just run the game…. Next panel shows the Java Applet, if your browser supports it. You probably have to confirm your browser a thousand times you want to run the Applet, since I did not sign it. Download the jar file. Runs as Java application or Applet. will find their way to oblivion. However, on reproduction mutation may take place. The clone may be more successful or inferior compared to its parent. In the end the most fittest creatures will survive! interaction from the user. You can create your own creatures though. The playground for creatures is the World. 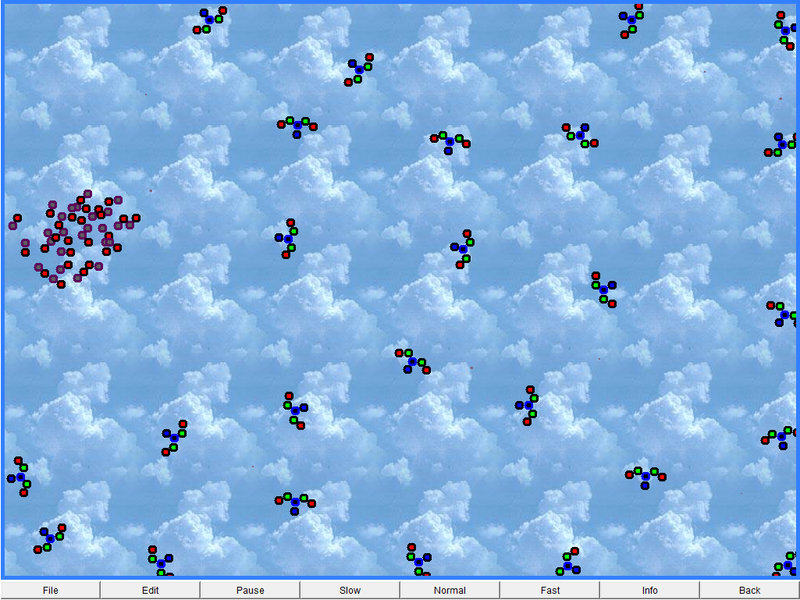 It is a flat rectangular space where Manure grows and Xreatures can crawl around and interact with each other. 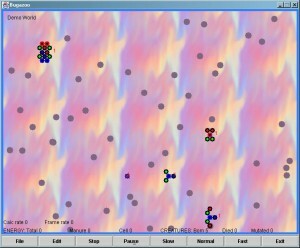 The user can choose from a number of Worlds. Each World has its own rules, influencing the behaviour of the Creatures. For example, in one World Creatures reproduce faster or can move easier around than in another World. This is the default World at start-up. The chances of mutation on a reproduction are 30%. In this World creatures need much Energy just to survive. Mutation chances are low. It is not easy to survive. This is the dream of each Creature. It hardly takes energy to survive. It hardly takes energy to reproduce. Just multiply! 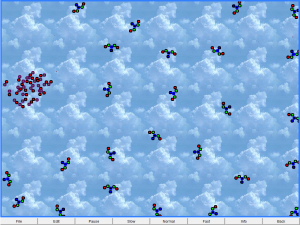 A Tjernobyl type of world in which Creatures mutate easily on reproduction (60%). In this world Creatures can move easily. They are hardly being dragged (decelated) by their environment. Dragger: a Dragger Cell is able to propulse the Creature. A Dragger Cell receives signals from Sensor Cells. It sums all signals (Vector summation) and exerts a force on the Creature. The strength and direction of the force depends on the summed Sensor signals. The conversion from sensor signals. 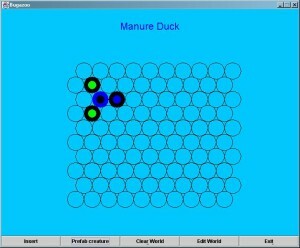 Manure Sensor: a Manure Sensor Cell senses Manure. It passes its signal to the Dragger Cells. If a Dragger Cell is more closely to the Manure Sensor, it receives a stronger signal. A Manure Sensor also senses Prey Consuming Cells (Predator sense) from other Creatures and signals Dragger Cells to move away from them. the distance to the center of the Manure. Prey Sensor: a Prey Sensor Cell senses other Creature’s Cells. The signal it receives becomes stronger when the energy of the other Creature’s Cell is larger. The Prey Sensor passes its signal to the Dragger Cells. If a Dragger Cell is more closely to the Prey Sensor, it receives a stronger signal. Prey Consumer: a Prey Consumer Cell eats other Creatures and supplies the Creature with energy in this way. Consumption starts as soon as the Prey Consumer Cell gets close to other Creatures Cells. Hybrid Cell: a Hybrid Cell has a bit of the functionality from all Cells metioned above. It is a multi-purpose Cell. In the initial Hybrid Cells all functionality is present in the same amount. Other Hybrid Cells are generated by mutation. In these Hybrids all functionality may be not equally present in the Cell. The colors of the Cell indicate its functionality. The border of the Cell indicates sensor functionality. The interior indicates consumer or dragger functionality. 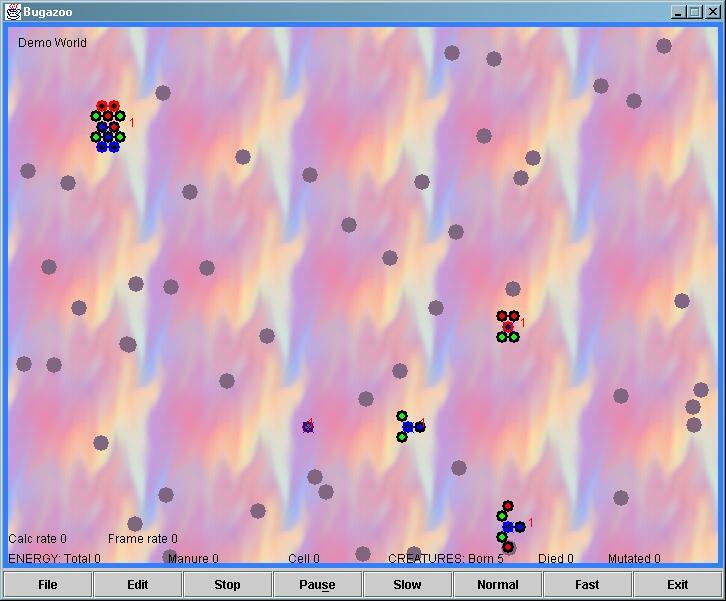 In Hybrid Cells colors are mixed according to its functionality. In order to be successful a Creature has to reproduce and pass it genes to a clone of itself. In order to reproduce the Creature has to eat food (Manure or other Creatures). Manure is pure energy. It is the grey matter scattered around the World. A Manure eating Creature eats it and gets stronger. Manure grows and originates spontaneously when time passes. Since the World is a closed energy system, all energy dissipated by creatures returns as Manure in the World. No energy is lost. The playground is were it all takes place. Here Manure grows and Creatures crawl around. File – Current state of the Playground can be saved or restored using hte File menu. Edit – Using the Edit Menu the user can create his/her own creatures or choose the World type. The creature factory. Can be used to create new creatures. Next picture shows a pretty example of an evolution. The world started was ‘Outer Space’. In this world movement is quite easy. The ‘Blind Lobster’ appeared to be quite succesful in this world. They do so by keeping the distance to other creatures as large as possibe while feeding on Manure. However, an mutant of the ‘Amoebe’ showed a remarkable behavior: this creature operates as a flock, hunting the ‘Blind Lobsters’. This flock chases the ‘Blind Lobsters’ and locks them in a corner. Fortunately, the ‘Blind Lobster’ often escapes, but sometimes get eaten. When running as Applet (in your browser) the File Menu does not work. Probably it has to do with security settings of your browser. Copyright © 2014 Studio Blue Planet. All Rights Reserved. The Matheson Pro Theme by bavotasan.com.